-12- [A?] POINT OF NO RETURN We've come through a long and difficult time in the last six months. It was a period in which we all questioned whether or not we should continue with our current programming. it was a time when we seriously questioned our own existence, yes the existence of the Chicano-Indian American Student union and that of the Chicano-Indian American Cultural Center. It was a time when we all allowed personality conflicts to become detrimental to our organization. It was a time when we thought we were in the Bermuda Triangle, a point of no return. However, we have survived these long and difficult times. Just as our people have for the past 300 years. But more important, we will survive another 300 years, if not more. It was during this difficult period that we grew closer to one another and learned more of each other. Granted that we come from a common ancestry, but we must also learn and appreciate our cultural diversity. We all come from varying backgrounds and represent all the regions of our country. It is for these very reasons that we should be more tolerant and sensitive of each other's needs. We should share our knowledge without ridicule; we should be able to constructively criticize without insult; we should care for one another and not destroy and hate. At the beginning of this semester several strategy meetings were held the CIACC to begin to resolve our difficulties. Unbelievable progress has been made toward this. I would like to offer all of you evidence that we are well on our way toward becoming once again a harmonious organization. On Tuesday, January 31, 1978, at the CIACC the Union invited Don Gillies and Angelita Reyes, both from the department of Special Support Services, to speak with us. Each gave a presentation on their area of expertise and what they have to offer us. For the first time in a long time I saw the gleam in people's eyes. There was nothing but warmth being radiated that evening. Many commented afterwards that they were happy they attended. However, don't let me convince you that we're alive and vibrant. listen to what Don has to say about what he found at the Center that evening. 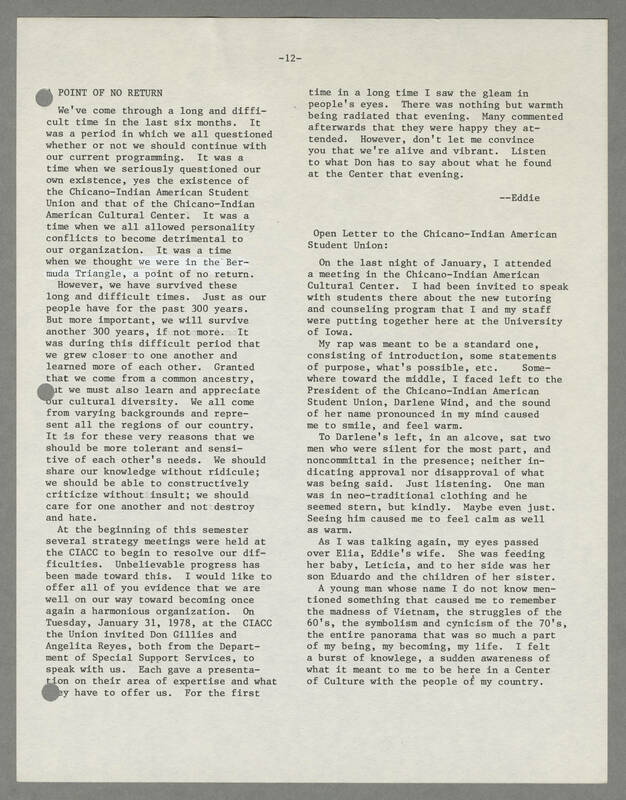 --Eddie Open Letter to the Chicano-Indian American Student Union: On the last night of January, I attended a meeting in the Chicano-Indian American Cultural Center. I had been invited to speak with students there about the new tutoring and counseling program that I and my staff were putting together here at the University of Iowa. My rap was meant to be a standard one, consisting of introduction, some statements of purpose, what's possible, etc. Somewhere toward the middle, I faced left to the the President of the Chicano-Indian American Student Union, Darlene Wind, and the sound of her name pronounced in my mind caused me to smile, and feel warm. To Darlene's left, in an alcove, sat two men who were silent for the most part, and noncommittal in the presence; neither indicating approval nor disapproval of what was being said. Just listening. One man was in neo-traditional clothing and he seemed stern, but kindly. Maybe even jut. Seeing him caused me to feel calm as well as warm. As I was talking again, my eyes passed over Elia, Eddie's wife. She was feeding her baby, Leticia, and to her side aw her son Eduardo and the children of her sister. A young man whose name I do not know mentioned something that caused me to remember the madness of Vietnam, the struggle of the 60's, the symbolism and cynicism of the 70's, the entire panorama that was so much a part of my being, my becoming, my life. I felt a burst of knowledge, a sudden awareness of what it meant to me to be here in a Center of Culture with the people of my country.